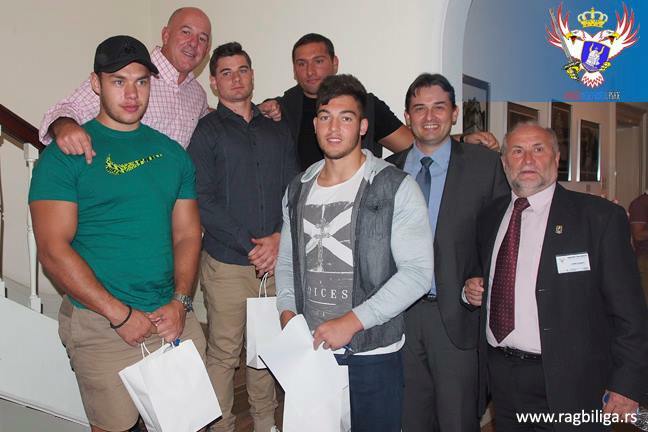 On 16 March, 2015, a reception was held at the Consulate General of the Republic of Serbia in Sydney, with a presentation from the Rugby 13 Federation of Serbia (R13FS), organised by Mr. Blagoje Stoiljkovic, representative of R13FS, who arrived in Australia to establish contact with the Serbian diaspora, as well as players of Serbian origin, and to promote the Serbian Rugby team participation in the upcoming qualification for Rugby World Cup which will be held in Australia in 2017. Presentation titled „Serbs in Australia – let's stand together for the Rugby League World Cup 2017!“ raised a lot of interest among the Serbian diaspora. Among the guests who responded to the invitation were representatives from the Australian Rugby League, SPC, Air Serbia, presidents of Serbian clubs and associations, prominent representatives of the Serbian diaspora, Serbian media, SOYA, many players of Serbian heritage, current and former, as well as their parents who have previously played for the Serbian representation, and potential future players who submitted their expressions of interest, so that they could „fulfill their dreams and play wearing the Serbian jersey“. The quality of players of Serbian heritage, huge support from their family and friends and all those with Serbia in their hearts, represent a positive energy and a huge motivation for the Serbian team in qualifying for the upcoming Rugy League world cup 2017 in Australia. For further information, all interested rugby players can contact the Serbian Consulate or Mr. Blagoje Stoiljkovic, representative of Rugby 13 Federation of Serbia, directly on blagoje.stoiljkovic@ragbiliga.rs. Column of the weekly newspaper "Serbian voice" on the above mentioned event can be seen HERE.